I miss Gentleman Wade Westin, a man who personified the term for which he was known. Fond memories of Sunday nights at the Chinese restaurant, or ribbing him about being the world’s nicest guy, or watching him on stage in the Medora Musical. He passed away four years ago today. It was an absolute privilege to have been his friend. I met Wade when he joined our production staff at KFYR-TV back in the 1990s; since then I’ve had many noteworthy memories, even though our opportunities to see each other grew farther and farther apart. Guys get busy, you know…that’s just how it goes. I wish it wasn’t so. A while before his passing, Wade and I met up at Taco del Mar and chatted it up about what we’ve been up to, fatherhood, and that kind of thing. We even talked about a possible project we could collaborate on, an idea I relished. That’s the last time I got to spend time with Wade. When we worked at KFYR-TV together we did a commercial for a furniture or mattress store, one where Wade played a guy who snuggled in under the covers of a comfy new mattress. It took a while for the nickname “Snuggly” to wear off. I had a printout of that shot somewhere in my souvenir box, but in my search for it tonight I came up empty handed. Bummer. 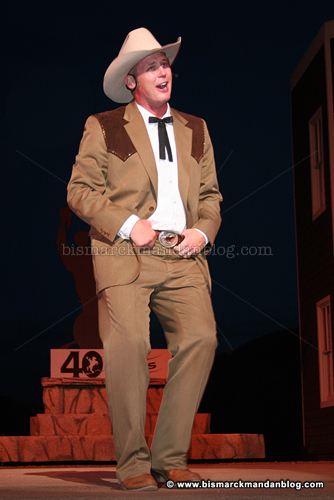 The photo above was from the Medora Musical on my honeymoon trip with my wife. I’d booked front row center tickets of course, planning a Medora weekend on our way back from a week in the middle of nowhere back in my beloved Rocky Mountains. We drove past the turn to Wade’s home near Grenora, ND and it prompted me to call his cell phone and say hi. When he heard we were coming, he arranged the VIP treatment and a backstage tour for us, and we got to chat with him and his family briefly before he left to prepare for the night’s show. He then congratulated us during the show. That’s just the kind hearted, generous guy that Wade’s friends will all remember. We used to hit the China Wok restaurant in Mandan on Sunday evenings, striking a friendship with the owners over time. When their visas came up for renewal, Wade took it upon himself to get his friends from the Sunday night dinners to sign testimonials to aid in their renewals. It’s a shocker to have a friend and fellow family man snatched away so suddenly and so early. Of course one tries to make sense of it, but there’s no sense to be had. What we can do is take comfort in the message from his CaringBridge page: “Thank you for your love, support and prayers. Wade is at peace with God His Father and Jesus His Savior in the healing presence of the Holy Spirit.” The Bible talks about a peace that passes all understanding…I pray for that peace for his family and everybody who misses Gentleman Wade. I have a copy of a TV commercial Wade did for KNDX (Channel 26) back when they first went on the air. It was a “dance contest” making fun of contestants with the numbers of other local TV channels. It features Wade being Wade. I attached a brief tribute at the end. It isn’t much, but it’s a token of my respect for a friend. The music is a portion of “In the Sweet By and By” performed by my friend Sarah. I know there are lots of people out there who are touched by Wade’s passing as they were by his personality. Hopefully this will trigger some of your best memories as well. This entry was posted in Family & Friends, In Memoriam by Clint. Bookmark the permalink.